One journal has retracted a paper containing images that recently raised suspicions of obvious duplications, and another journal is planning to do the same. Scientists first leveled accusations against the newly retracted paper in Scientific Reports, along with two others by the same researchers, earlier this month on Twitter. One other journal — PeerJ — has announced that it plans to retract one of the questioned papers, as well. The third paper, in Frontiers in Pharmacology, bears an expression of concern. It was unusually quick action on the part of the journals, as well as the authors’ host institution, the University of Malaya, which announced last week the authors had manipulated figures in all three papers, along with one other. This Article has been retracted by the Editors and Publishers of Scientific Reports. Following online criticisms of the published paper, an investigation at the journal has confirmed the manipulation and duplication of data and a level of image processing that is not compliant with the journal’s policies on image data integrity in figures 1–3, 6, 7, 10 and 12. Versions of figures 1–11 and large sections of the text had also previously been published1,2. All authors acknowledge these issues and agree to the retraction of the Article. There are 13 figures in total in the paper, which was originally published in April. “Mechanism of Action of the Novel Nickel(II) Complex in Simultaneous Reactivation of the Apoptotic Signaling Networks Against Human Colon Cancer Cells” was published in Frontiers in Pharmacology in January, and flagged last week. “Mechanism of action of novel piperazine containing a toxicant against human liver cancer cells,” was published in PeerJ in March, and flagged with an expression of concern on June 10th. Unfortunately wrong-doing goes undetected in academic literature during peer review from time to time. This article was peer-reviewed by 2 external reviewers and the named Academic Editor, all of whom missed the manipulation for reasons unknown. Of course cells in each step should be same with each others. For instance, all cells which underwent blebbing must be same until they confirm as blebbed cells based on morphology of the cells. 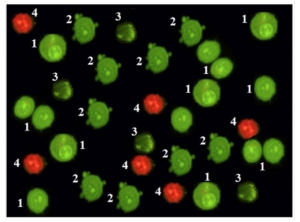 This test is 100% based on morphology of cells only…They can not be copy pasted cells but morphology is same. The Journal and Authors retract the 28 January 2016 article cited above for the following reasons: Following online criticisms of the published paper, an investigation at the journal has confirmed the manipulation and duplication of data, and a level of image processing that is not compliant with the journal’s policies on image data integrity. We’ve also heard from a UM spokesperson that the fourth paper they’ve recommended be retracted is “Revamp of the apoptotic signalling pathways and cell cycle arrest in colon cancer cells induced by novel copper based compound and its molecular mechanisms,” published in 2016 by Recent Patents on Anticancer Drug Discovery. We’ve been unable to find a copy of the paper on the publication’s website. The accepted article entitled “Revamp of the Apoptotic Signaling Pathways and Cell Cycle Arrest in Colon Cancer Cells Induced by Novel Copper Based Compound and its Molecular Mechanisms’’ by Nima Samie, M.S. Kanthimathi, Sekaran Muniandy, Anita Marlina, Zahurin Mohamed and Norbani Abdullah was withdrawn by Dr. Nima Samie on his request at the final stages of publication and later on we have received the consent of all co-authors for withdrawal of this manuscript. This article was planned for our next issue 2016 which is not published. We have withdrawn this article from our websites [Epub ahead of print] and online Content Management System. “Unfortunately wrong-doing goes undetected in academic literature during peer review from time to time.” Recent experience has shown me otherwise as more and more gets detected. This case got traction and a rapid resolution because of Twitter. Two weeks ago, first author Nima Samie denied any wrongdoing. What changed his mind?